Being rooted in Daoism and ancient Chinese shamanism, Qigong contains the wisdom that has served humanity for over 5,000 years. Qigong has changed my life and continues to do so. Being rooted in Daoism and ancient Chinese shamanism, it contains the wisdom that has served humanity for over 5,000 years. These teachings and practices are extremely relevant to strengthening health, cultivating vitality, and finding balance and harmony within ourselves as well as between people and the whole world. In recent years, as I have studied and practiced Medical Qigong, I have experienced a lot of changes in how to improve my health and help others improve theirs, how to behave and prioritize, how to understand and treat other people in critical moments and routinely, how to be more honest with myself, how to be a better parent, and many more. I have been training with the International College of Medical Qigong since 2011 attending practitioner and therapist certification programs as well as advanced medical qigong seminars. With WE QIGONG, my hope is to contribute to the expansion of a Qigong community, to share the teachings, and to encourage people to try it as a treatment and as a cultivation practice. Qigong appeals to me both as a mystery and as a Universal demystified simplicity and truth. On one hand, one can be amazed by how energetic transformations drive the improvement in our emotional and physical health. One shift may trigger multiple subsequent changes in our lifestyle and path. It can gradually ripple through and fruitfully manifest in unexpected aspects. On the other hand, we realize that we are one with nature and this world, and are continuously connected with all. There is nothing surprising in energy being so transformative. Wondering what qigong treatment is like? During the treatment with a Qigong Practitioner, you will experience a Medical Qigong Qi Emission Therapy where you will lie comfortably on a massage table, fully clothed, and without shoes. 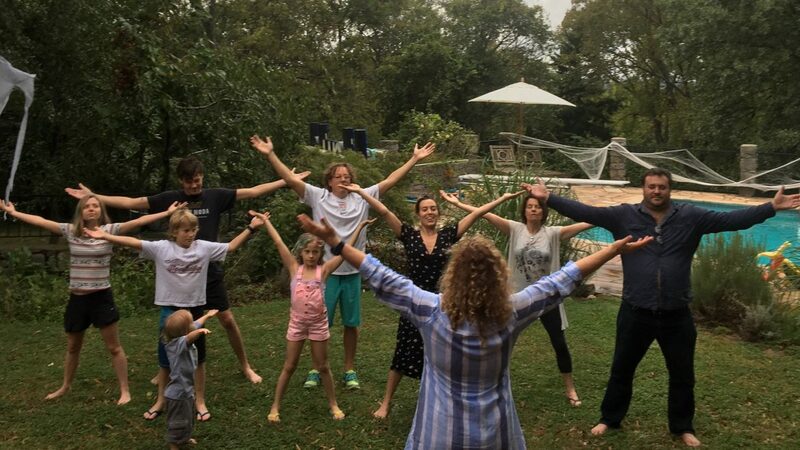 QIgong Practitioner will energetically connect with you, and perform a protocol of cleansing and tonifying internal organs as well as balancing the energy within your body. From this, you will experience deep relaxation and energetic rejuvenation. In addition, you and the Practitioner will address any specific issues that are of a concern to you or may become evident during the session. The treatment may also include protocols for releasing toxic energies or seasonal practices. You may receive suggestions for independent work and learn components of Qigong practice that are of interest to you, for example, breathing and relaxation techniques, focusing and guiding intention, specific Qigong exercises, making energetic observations, performing energetic cleanse, sensing and cultivating energy, among others. What is qigong class is like? The goal of an introductory Qigong class is to provide background information on Qigong, its principles and guidelines for practice. Students are invited to practice proper breathing mechanics, explore basic purging methods, learn a grounding meditation, experience the movement of the Qi, and, most importantly, perform an ancient Shaolin technique for releasing toxic energy. Overtime, students learn the Daoist Five exercises to purify and strengthen their internal organs. Students also study Hun Yuan exercises to develop their energetic skills. Continuous Qigong practice allows the students to improve their meditation skills, sharpen their focus and intention setting abilities, and learn some Qigong exercises that help energy sensing, cleansing and cultivation. Students experience Qigong as a mind-body practice that improves their mental and physical health. Born and raised in St. Petersburg, Russia, Yuliya Gulmi moved to California where she attended Santa Clara University receiving a B.S. degree in Economics. She also earned an MBA degree at the Wharton School of the University of Pennsylvania. After business school, Yuliya worked in the banking sector with positions in investment banking and equity research. She and her husband, Bradford Gulmi, live in Nashville, Tennessee. Currently Yuliya is focusing on raising their children. Yuliya has been training with the International College of Medical Qigong since 2011 attending Practitioner, Therapist and Master certification programs as well as advanced medical qigong seminars. Visit weqigong.com.